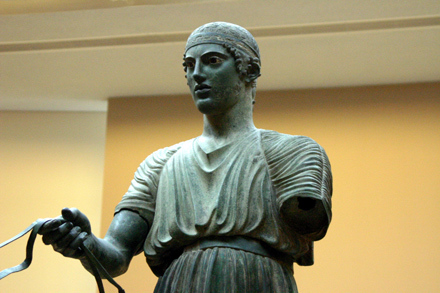 The “charioteer” is a life size statue in bronze that was cast about 475 B.C. It was discovered in 1896 near the Temple of Apollo. Usually bronze statues such as this were melted down and recycled after they had outlived their usefulness/interest. But his statue had fallen off its pedestal and was crushed during the earthquake of 373 B.C.—and thus has been preserved almost in–tact. The Charioteer is 5 ft. 11 in. [1.8 m] high. This bronze statue was dedicated to Apollo by Polyzalos, the ruler of Gela in 478 B.C.—when he won the chariot race at the Pythian Games at Delphi. It was originally standing in a chariot that was pulled by four horses and the whole grouping was placed on the top of a monument and viewed from below.